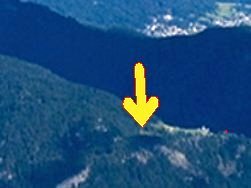 From the slopes of mount Pore, near Colle Santa Lucia, a squat spur jutts out, called Col Megon, where pre-historical hearths have been dug out (Palmieri). If we have to believe Wolff, the Megon de Megojes, Tsicuta's home, was a secondary top of mount Migogn, abruptly dominating the Pettorina stream. The Migogn is the last group of the Padon chain towards Roccapietore. It's noteworthy, however, that just in front of the Migogn (on the Cordevole side, anyway) this spur named the same way can be found. Both names can be easily connected with the Latin mecon, poppy, directly derived from greek; as a matter of fact, the main feature ascribed by the legend to the Megon is just that of getting covered with red poppies, although later on we shall discover that these are very special flowers (they are an enigmatic allusion to the fire lit by lightning and soon extinguished by rain). It isn't fully clarified why the former, the latter, or both, should have drawn lightning; maybe the effect of surface ore veins, today presumably wholly exhausted, can be seen behind that. The mentioned pre-historic findings increase the chance that the Col Megon may have played a part of some importance in a remote past. Anyway, if the Megon was located on the slopes of mount Pore, no wonder that Ey-de-Net looked for it weeks long to no avail, as he was combing the Migogn! Well visible from: nowhere. Better coming close. It can be noticed, however, from the area of Caprile or from Livinallongo. Larzonei; in the background the villages of the Fiorentina valley. Excursions: the hill (Col Megon, m 1686) can easily be accessed from the road to Larzonei, that runs close by. 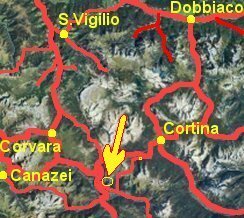 From Colle Santa Lucia m 1435 or from Larzonei m 1577, climb to monte Pore m 2405, where the remains of the large iron mine named Fursill can be found. The mine was already exploited in pre-historic times; later, the bishop of Bressanone derived from it his "Lamb iron" (so called from the brand it was impressed with), known for its excellent quality.